We bring forth a smooth sliding Slider Zipper, which is available in PE and PP. It is made from diverse compounds for the purpose of achieving desired softness and strength. 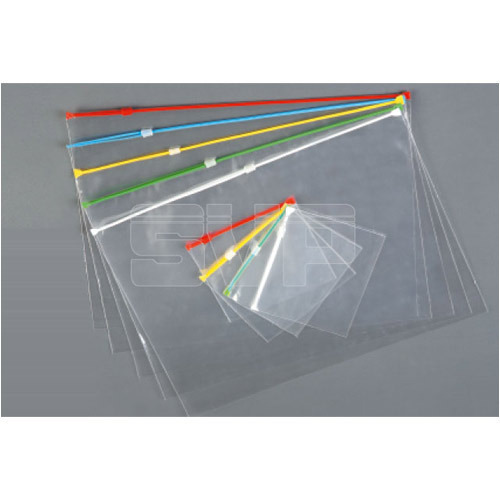 There is a great demand for these for making pouches and slider bags from mono and multilayer laminates and films. With the fixation of a slider, zippers can be opened and closed with ease. Established in the year 1981, we, Svp Packing Industry Private Limited an ISO 9001:2008 certified company. We are engaged in manufacturing and supplying a wide range the best quality of Zipper Bags and Zipper Profiles. The product range offered by us is inclusive of Zipper Profiles, Zipper Bags and Attached Zipper Bags. These Zipper Bags and Zipper Profiles are designed in compliance with the industry set norms and regulations by using sophisticated machinery. In accord with the requirements provided by the customers, the offered zipper bags and zipper profiles can be customized. Their finish, design, durability and resistance to shrinkage, make these zipper bags and zipper profiles highly appreciated among our customers. In a zest to attain maximum customer satisfaction. We follow customer centric approach and ethical business polices. The best possible quality of the offered zipper bags and zipper profiles is our utmost priority and it is maintained as per the industry set norms at our end. Owing to our large production capacity, we have been able to meet the bulk demands in the most efficient manner. These products find wide applications in household purposes, automobile industry, jewelry and electronics industries.